CrossFire Bed Bug Concentrate kills pyrethroid-resistant bed bug strains at all life stages, including eggs. Available as both a concentrate and an aerosol, the patented formula with multiple modes of action is the only bed bug product with three actives. The results save time and money. Rest easy with the ideal bed bug solution. CrossFire changes everything. Do you have recommendations for how to best dilute CrossFire Concentrate? Shake the bottle thoroughly before mixing. When pouring, the material should be uniform in appearance. 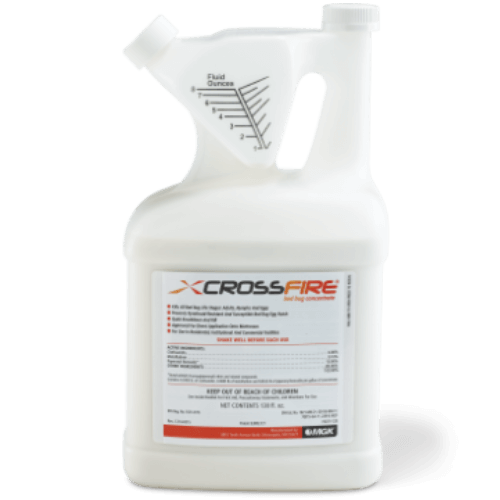 Put 64 ounces or 0.5 gallons of water in the sprayer, then add 13 ounces of CrossFire concentrate. Top off the sprayer with an additional 51 ounces of water to achieve 128 ounces or 1 gallon of finished product. Shake the sprayer thoroughly before applying and shake periodically during application. We recommend you empty and clean the sprayer at the end of each day of use. If product remains in the sprayer overnight or longer, thoroughly shake the sprayer, then pressurize the sprayer and disperse 1 to 3 ounces of material into a container to clear the line and nozzle. Pour the material back into the spray and vigorously shake the container before use. Always remember to follow label instructions.